Really. They are. Would I lie to you? I love you all to death so I would never lie about something as important as the ickiness factor surrounding those orange…things. I don’t like carrots (in case the above sentences didn’t clarify that). I will eat baby carrots if they are cooked almost to the point of mush and then covered in about 16 pounds of butter per carrot and salt. I will eat carrot cake. I mean c’mon, it has cream cheese frosting and is gooey and…well…it’s cake. I can forgive it for having carrots. I’m also that person who, upon getting one of those bagged salad mixes, picks out every single carrot shred out of my bowl and throws it in my husbands serving. Raw carrots are even yuckier than cooked ones. But… BUT I say! I like carrot cake. So when I saw a recipe for a quick bread that had a strong resemblance to carrot cake or would once I got through with it, I knew I had to make it. The original recipe is from Food And Wine. For the most part, I was true to the original but I seriously wanted it to be a bit more carrot cakeish but in quick bread form. That way if I wanted six slices for breakfast, I could honestly say that 1) I was NOT eating cake for breakfast and 2) it has carrots in it so it’s good for me. Right? So I added more spice to it, a TOUCH more oil (and I do mean just a little; just enough to increase the moistness w/out compromising the stability of the bread), raisins and the crowning touch of a cream cheese glaze. This is good. Really good. I may or may not have eaten three slices already and scraped all the excess glaze out of the bowl with my tongue finger. Tender moist cake bread, stuffed full of raisins and sweet spices and a tangy sweet and creamy cream cheese glaze. And oh yeah, those orange things. What are they called again? Oh yeah… carrots. Go buy some orange things and some cream cheese. Preheat oven to 350. Spray two 8 inch loaf pans (don’t use 9 inch for these; the finished loaves will be too thin) with cooking spray or grease and flour pan. In a medium bowl, combine the flour, spices, baking powder, salt and baking soda. In a large bowl, beat the eggs with the sugars until smooth. Add the oil in a thin stream, beating at high speed until the batter has pretty much doubled in volume. This will take about 3 minutes or so. Fold in the shredded carrots and the raisins. Beat in the dry ingredients in three batches, beating well after each one. Note that this called for beating well, unlike most quick breads that call for beating until just barely combined. Pour the batter into the prepared pans, dividing evenly. Bake in the middle of a 350 degree oven for 50 minutes to an hour or until a skewer inserted in the middle comes out clean. Let the loaves cool in the pan for ten minutes before turning out onto a rack to finish cooling. While they cool, make your glaze. Combine the cream cheese and butter. Beat well at high speed until light and fluffy. Add in the powdered sugar, vanilla and lemon juice. Beat well. Continue beating until the glaze is creamy and smooth. If too thick, add a touch of heavy cream or milk. But add dribbles at time to prevent getting it soupy. Glaze the bread with a thick gooey coating of the yummy stuff. Serve cut into nice thick slices, spread with any remaining glaze. Store this covered in the fridge due to the cream cheese glaze. Alternately, you could leave it unglazed and just use keep the glaze refrigerated and spread it on at serving time. P.S.- if you omit the glaze, this is a good vegetarian breakfast or snack. I’ll cry of course if you DO omit it but that’s ok. This entry was posted in Breakfast, Easy, Quick Breads, Snacks and Appetizers, Vegetarian and tagged carrots, cream cheese, easy, quick bread by Janet. Bookmark the permalink. Hehe…I am laughing at the title of this! I feel the same way about celery…unless it is loaded with PB. Carrots are alright (not my favorite but I will eat them)…unless of course they are in a delicious bread like yours! It sounds wonderful :)! I hate carrots. HATE! My wife tries to feed me “glazed” carrots, which are just carrots, with sugar. Blech. But, I too, will eat carrot cake/bread. Nom! I love carrots! I can’t stand them cooked (much like most veggies), but I love them in salads or alone. I can’t eat cabbage, but I love coleslaw. So my substitute is shredded carrots with coleslaw dressing, or a good vinaigrette. That looks like the best way to eat carrots I’ve ever seens. Delicious recipe. …who is this person in my house who doesn’t like carrots…? Mmm, looks delicious! I like carrots cooked/baked, but raw… not so much! Then you’d love this Kiri! The key to changing “yucky food” into “yummy food” is the preparation. You most certainly found the key here in this spicy sweet bread and yes, carrots in a baked good require a cream cheese icing. 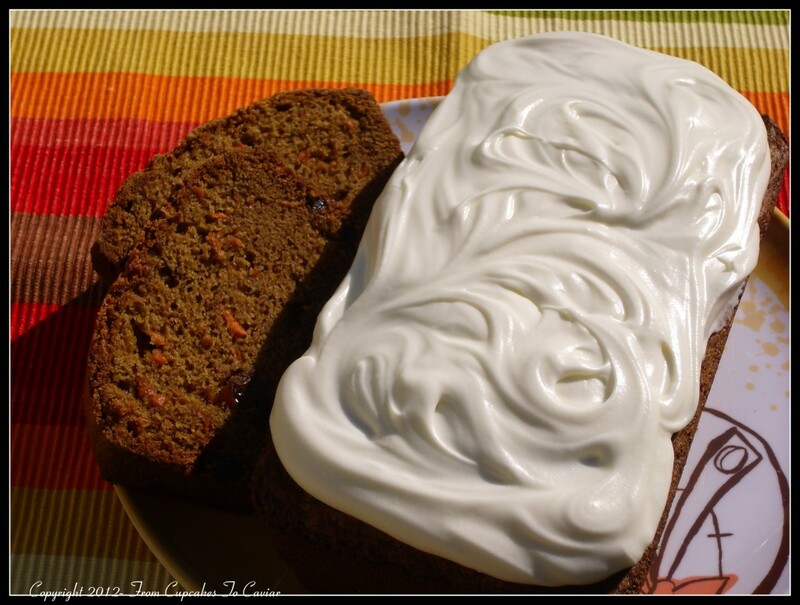 Now let me dig out that cake recipe with sauerkraut for you…..
Love all things carrot, in fact had carrot cake for Easter but a carrot bread sounds wonderful. Not realy a clove and ginger fan…like raisins in salad but not in bread so was thinking of leaving those items out….???? I like your theory on eating bread isn’t eating cake…works for me and added to my excuses..ha! Janet – that looks delicious! I love carrots and adore carrot cake, but alas, I must only eat carrots because of my allergies. (to cinnamon, not Mary Ann or Gilligan!) Fun post! I am baffled when people don’t like carrots–I don’t know why, haha! I love them raw too, not so much cooked but I’ll still eat them with a nice ginger glaze or butter. I love carrot cake when it has lots of pineapple and no raisins too. Your bread looks beautiful, I love how the frosting swirls! LOVE this!! I will eat carrots raw, but only a few of them. Cook them, and I won’t get with 10 feet of them! But I love this bread! And the glaze, oh the glaze!!! Can I just eat the glaze? Ok, never mind. I eat baby carrots because they say it helps your eye sight. I have horrible eyes. I force myself to eat carrots and have yet to see any improvements. I would gladly eat buckets full of this bread though. It sounds really delicious. And it is bread even with the frosting because it is made in a loaf pan. I think my favorite way to enjoy carrots is in cake too. This bread looks divine and I am totally drooling looking at that glaze! I love carrots. In fact, I may go get a crunchy one now to snack on. Love this recipe!